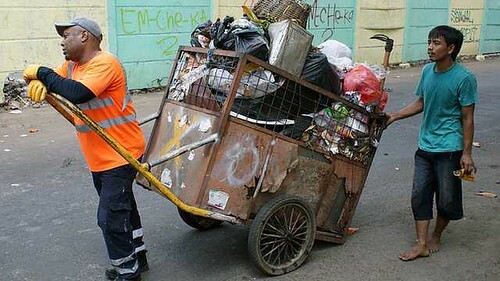 10 days spent in jakarta, rubbish collector Wilbur Ramirezbe, came and became a binman in indonesia. He work with iman syaffi, Indonesian binman, and compare what he done. Hard work, polution and also smell not good became part of his job make him touched. But he only 10 days, how about syaffi that feel everyday. In his country, Wilbur collect a rubbish by his friend, with nice car including air conditioning and easy way to treat a garbage. At home, he also have a nice home and healty meat to eat. He have much time playing with his son. but syaffi, represent a binman from Indonesia, he live at dirty house and he don't have much money to schooling his son. Syafii work in the place that people don’t care about a garbage. So, wilman, binman from england care about our people, but when we will care? I think this time we should separate garbage before we throw it, so people like imam syaffi don’t too hard maintain garbage.